One vital part of your overall Pomeranian’s care is the clipping of his nails. How often you do this will vary depending on if he’s an outdoor or indoor Pomeranian. If he spends most of his time outside, his claws will wear down naturally on rough surfaces and so they won’t need clipping as often. If he’s inside mostly, then once or twice a month is how often his nails will need to be trimmed. 3 What is the quick? 4.2 What if his nails get too long? 4.3 Use the right tools. 4.4.1 Here are reviews of the top five tools for your dog’s nails. 4.4.1.1 1.OmegaPet Nail Clippers are the best plier-style clippers. 4.4.1.2 2. The best scissor-style clippers are the Expert Dog Nail Clippers with the big handles). 4.4.1.3 3.Resco original professional pet guillotine nail clippers. 4.4.1.4 4. The Dremel nail grinder is the best grinder for your dog’s nails. 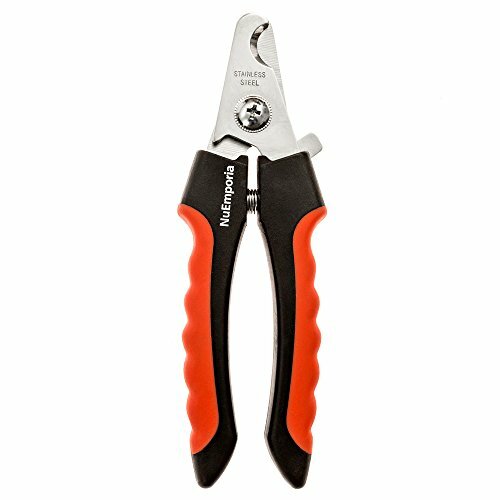 4.4.2 To Help You Choose The Best Tools for Dog Nail Trimming, Here’s a Breakdown of Each One. 4.4.2.2 Scissor-like dog nail clippers. 4.4.2.3 Plier-style Dog Nail Clippers. 4.4.2.4 Guillotine-style Dog Claw Clippers. This isn’t a job you should rush. Take your time and ensure you don’t miss a single toe. Use treats to keep him happy so he’ll associate trimming with yummy treats and so it won’t be an unpleasant experience. Prep your Pom first. Pat his paws and throw in a tummy rub so he gets used to you touching his paws. This will only make the job easier for you both. 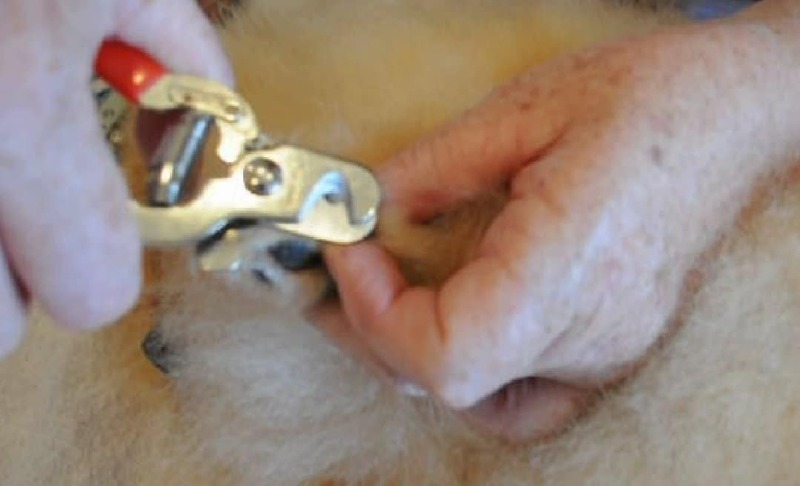 Cutting your Pom dog’s nails can be easy or extremely difficult, particularly if you’re new to this task. Ask your vet to do it if you can’t manage it yourself and/or you’re nervous about hurting him. The vet may let you watch so you can learn. If you look at your own finger nails, you’ll see a pink part and that’s the quick in people AND in dogs. If cut, the blood vessels can hurt and will often start bleeding. It’s essential that you have plenty of light so you avoid doing this. Only cut small pieces of nail at a time while moving the clipper in a parallel motion to help prevent accidentally cutting the quick. Take extra precautions if his nails are black as it will be much harder to find the quick. The colour of his nails will depend on what colour his adjacent skin is. Light coloured claws are simpler to cut than the darker coloured ones because you can see the quick much more easily. You should cut your pet’s nails to within 2 mm of his quick. Before clipping toenails identify the “quick” in each toenail. The quick is easy to see on light coloured toenails, but very difficult to locate on dark coloured toenails. The quick is actually a blood vessel that flows through the middle of each toenail. This blood vessel will grow down near the end of the toenail if nails are not trimmed. With regular trimming the quick will recede, making the task of toenail clipping much simpler. The best time to clip toenails is just after the Pomeranian’s bath, as the warm water will soften the nails. If using a grinder trim nails before bathing. If the nail is a dark colour and the quick can’t easily be seen, make numerous cuts starting at the claw’s tip until you can see the grey or pink oval on the nail’s surface. Always use trimmers that are sharp and clean because they’ll cause much less trouble. The rear claws are usually shorter and need less cutting than the front ones. To finish off, use a file to smooth the surface. Always have the trimmer blade facing you and not your pet so you don’t cut into the quick. If you do cut it, your dog will suffer pain and bleeding so take good care. If you do cause bleeding, it will usually stop after a couple of minutes. 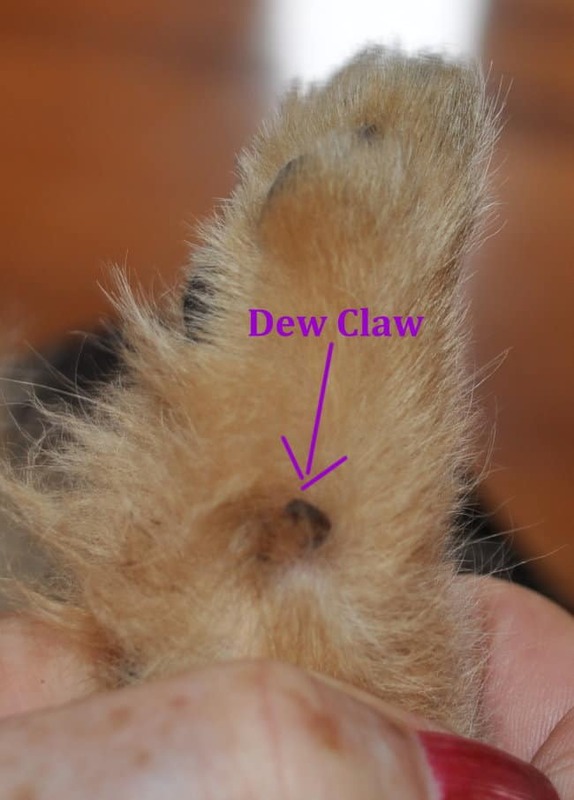 The inner side of your pet’s paw is where the dew claw is located and it’s connected to his leg by some loose skin. The dew claw never touches the ground but may grow long enough that it grows into the toe-pad. You can bend it away from your pet’s leg so you can use a guillotine trimmer on the tip. Over time, you’ll get more comfortable with clipping the nails of your dog. However, if you don’t want to, or can’t do the job, there are lots of professional groomers or vets available. Keep calm. Both you and your dog should remain calm because he’ll sense how you feel and will respond the same way. Start by gently rubbing his paws and giving him a tummy rub. Light and weather. Always have plenty of light when you clip your dog’s nails so you can get a clear view of what you’re doing. If possible, do it outside so he has extra room to relax. If he’s anxious, it won’t be an easy job because he’s likely to squirm and whine and that can cause an accident. If the weather prevents you from doing it outside, choose a bright room in your house and, if it’s hot, use a fan to help keep you both cool. Grip. When you hold your dog’s paw, don’t grip it too loosely or you may release your hold. Conversely, don’t hold it too tight as it may cause discomfort to your beloved pet. Fur away. Pull his fur out of the way while you’re working on your dog’s nails. If necessary, trim the hair with a hair trimmer, not the nail clipper as it will dull the clipper blades. Begin to clip. Be gentle when clipping and place the blade in a parallel position, with the blade facing you, to avoid cutting the quick or causing any bleeding. If you do cut it, your dog will feel pain and some bleeding but it will usually stop after a couple of minutes. The dew claw on your dog’s front paws might need to be trimmed. This is often known as a grooming nail and is related to your pet’s hygiene. Treats are useful for training and comforting. Keep a few treats within easy reach because you may damage one or more nails, causing your beloved pet to suffer a traumatic experience. You need to maintain your dog’s understanding that clipping is a positive experience so give him treats after you have trimmed his nails and also during the treatment if necessary to settle him down. If you’re on your own and are trying to trim your Pom’s nails, he’ll most likely make a fuss, especially in the early stages. Cutting your dog’s nails can be easy or extremely difficult, particularly if you’re new to this task. Ask your vet to do it if you can’t manage it yourself and/or you’re nervous about hurting him. The vet may let you watch so you can learn. What if his nails get too long? His nails may bleed, break or split. They can tear or get caught. They’ll curl and this may cause your pet to have discomfort when walking because it adds more pressure to his toes, often to the extent that they pierce his paw, which then causes pain and infection. If you’re going to trim your pet’s nails, you must have the right tools. Generally you’ll only need trimming scissors. There are three types of these scissors: pliers, scissors and guillotine. 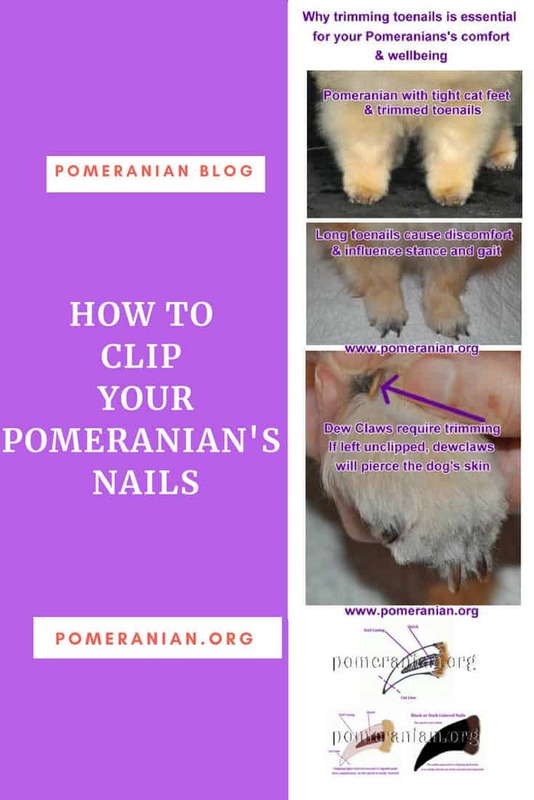 Your choice will vary depending on the type of nails your Pom has. Once you finish trimming, use a metal file to smooth all rough edges. You can use styptic powder if you accidentally cut your pet’s quick.Dog hair clippers can easily cost $100-$200, whereas the best nail clippers can be bought for under $30. Don’t go cheap and buy a $4 tool because it will easily break your dog’s nails instead of doing sharp straight incisions and you’ll end up spending more on a good tool you should have bought in the first place. Here are reviews of the top five tools for your dog’s nails. 1.OmegaPet Nail Clippers are the best plier-style clippers. 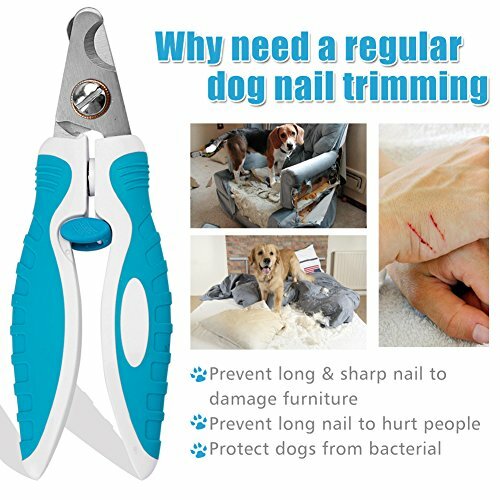 Dog Nail Clippers and Trimmer – Toenail Clippers with Quick Safety Guard to Prevent Overcutting – Dog Nail Trimmer to Smooth Out Nails – Painless Grooming for Large Breed Dogs Over one thousand pet owners made the time and effort to write reviews. The blue clippers are ideal if you have a low budget and are suitable for medium to large breeds. The smaller pink clippers are best for toy dog breeds and cats. The price is affordable, and the tool comes with a quick guard to stop you from cutting it. You’ll also receive a nail trimmer for that final polish. The blades are very sharp for easy cutting through even the thickest of nails. The handles have an ergonomic shape designed to prevent fatigue in your hand if the grooming takes a while. This product is such good quality that it comes with a lifetime warranty. 2. The best scissor-style clippers are the Expert Dog Nail Clippers with the big handles). Expert Dog Nail Clipper | Ultra Sharp Stainless Steel Pet Trimmer with Rotatable Safety Guard and Lock | Safe Professional Home Grooming for Cats and Dogs of Any Breed | Nail File Included | 912 If you’re grooming any small animals including puppies and cats, ergonomics is an essential aspect of any tool you will need to use. Standard size tools don’t usually give you the ideal grip so you can do the nail trimming properly. Ebelyn found a great solution by making the handles huge in size so it’s much easier to do the job. Ebelyn nail clippers are cheap but you can only use them for small dogs as they haven’t yet been adapted for the thicker nails of medium to large dogs. The tip and blades are rounded as they have been specifically designed to trim dog nails, unlike generic tools you buy for multiple jobs, one of which may be to cut your dog’s nails. They won’t do a satisfactory job. They’re simple to use because everyone knows how to operate scissors safely. However, when doing the final precision work, you need either a nail file or a grinder. 3.Resco original professional pet guillotine nail clippers. Resco Original Deluxe Dog, Cat, and Pet Nail/Claw Clippers. Best USA-Made Trimmer, More Colors & Sizes Resco is an American iconic name in the world of deluxe pet, cat and dog nail clippers and they come in more sizes and colors than tools from their competitors. They opened their doors 80 years ago with their first product – the guillotine nail clippers – and Resco has stood proudly as an industry leader since then, with their range of tools for pets of every size and shape. The durable mini guillotines are available in large, regular and tiny and the chrome plating comes in multiple colors. Blades are cheap to replace but should last a very long time and all products come with lifetime warranties. At just over $10, it’s money well spent. 4. The Dremel nail grinder is the best grinder for your dog’s nails. Dremel 7300-PT 4.8V Pet Nail Grooming Tool The cost of electric nail grinders is generally double that of manual tools but the use and end result of your dog’s nails is very positive. Grinders are best suited for medium to large dogs. If your dog is small, usage of a grinder is overkill. It’s made from high-density plastic and is supported by an outstanding engineering team you would expect from a world-class brand such as Dremel. This Dremel grinder is the commonly used tool of all nail grinders. However, it IS expensive if you only consider the cost. It’s worth every cent if you need a grinder for your dog’s nails. It has two speed settings: 6500 and 13000 RPM, enabling you to adapt to your pet’s level of stress and the time and amount of work needed. The grinder is cordless and light in weight, removing constraints such as the cord, so it’s easier to move. One factor to consider is that it will make noise and if your dog is very skittish, it may not be a suitable tool to use. You’ll need sanding bands and 60-grit drums so you can work gently while trimming your dog’s nails. A 4.8 volt battery has enough power to create smooth cuts, but won’t go so fast that his nails become damaged. The Dremel grinder has minimal down sides which is great news if you’re new to using such a tool. They’re less dangerous and intrusive but the price is higher. 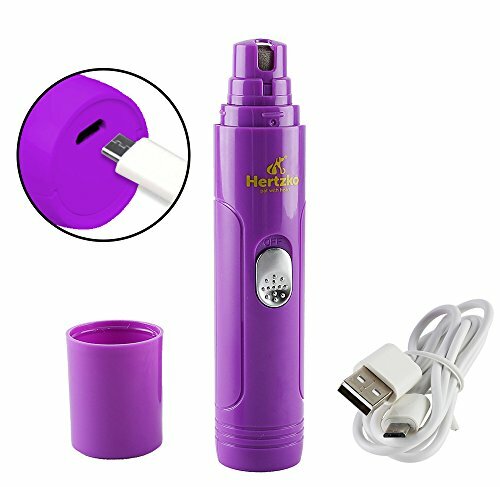 Is a company most commonly known for their de-shedding brush, but they also offer a high quality, low-priced, pet nail grinder.FURminator Nail Grinder It provides a smooth trim, thanks to its powerful rotary motor, and it also has a LED light, enabling you to see exactly what you’re doing at all times. The FURminator comes with batteries and grinding bands and is a comfortable to use, lightweight tool. It only has a single speed so if your focus is mainly on money, this is your ideal choice. Otherwise, spend an extra $10 and buy the Dremel. To Help You Choose The Best Tools for Dog Nail Trimming, Here’s a Breakdown of Each One. The majority of dog owners think a grinder would be a better tool for clipping dog nails and avoiding any accidents that may cause bleeding. Some grinders are battery-powered and others are powered. It’s better to use a cordless option if you’re new to nail cutting because there are no cord to hinder your best efforts. A grinder is similar to a nail file but specially designed for dog nails. Most Pomeranians hate having toenails clipped and an alternative method of trimming toenails is to use a small grinder. 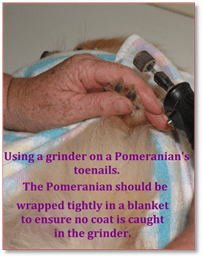 Care must be taken when using this method, please wrap your Pomeranian tightly in a blanket or towel to prevent the Pomeranian’s coat being caught in the grinder. This type is extremely popular due to its simple design and plenty of available places to buy them from. These clippers resemble scissors except for the addition of a notch on the blade’s tip, enabling it to cut dog nails. Perfect for smaller dogs due to their cutting power and size. Simple to hold. Constructed from a lightweight material, a beginner can use them and clip nails like a professional. Heavier types may cause your hand to feel fatigued. Easy to buy. Being cheap, you can purchase them from most pet shops and this is extra handy because you can replace blades or other parts when necessary. These are designed for beginners, have simple features, are easy to use and can be bought from most pet shops. They look like pliers and you get a great view of your dog’s nails as you remove the excess amounts. Most plier-style clippers have a guard so there’s no feat of accidentally cutting you pet’s quick. These are very cheap but are still more expensive than the scissor-like clippers. It’s good to use these clippers if: You’re a novice when it comes to cutting a dog’s nails. The designed head of the clipper gives you clear line of sight to the nail. Your pet has thick nails. The plier-style nail clipper applies enough force to handle the job. This cutting mechanism looks a lot like groomers or nail cutters people use on themselves. The guillotine is similar in concept to the blade that cuts/slices vegetables. There are two blades that shut to allow you to cut the nail by simply squeezing the clipper handle. Dogs with arthritis. If your dog has pain in his paw or hand, this tool is perfect because its clipping mechanism is so smooth and simple to use. Dogs with thin or soft nails. If you use this tool on thick nails, the clipper may break so avoid using it on thick nails. However, there are several of these type of clippers that allow you to cut thick nails. Dog grooming. It’s not wise to use these clippers unless you’re experienced at trimming your dog’s nails because the blade design blocks your sight of the quick and so you may cut it. A grinder can be utilized specifically to care for your dog’s nails because it acts like a nail file or sandpaper. The trimming process is slower but safer but be aware that a grinder can get hot so you should only do a second of trimming at a time to avoid causing your dog any problems. You want a gentle approach that has no chance of cutting the quick or any other nail accidents. You want your dog’s nails to have a smooth finish that’s better than the job manual clippers can do. It also reduces the possibility of him getting nails stuck in your furniture or clothing fabrics. Your dog has black nails because they make it tougher to see the quick so a grinder greatly reduces the risk of touching the all-important quick. Inexperienced owners prefer a grinder as they don’t actually do any cutting. 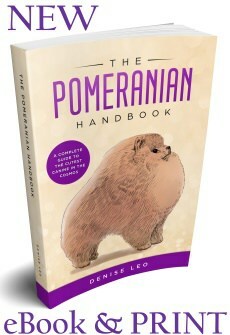 Is your Pomeranian just an animal or a loved member of the household? How much is too much when it comes to the correct care of your Pom? Only you can decide. 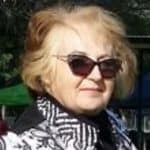 Copyright Pomeranian.org. All Rights Reserved. 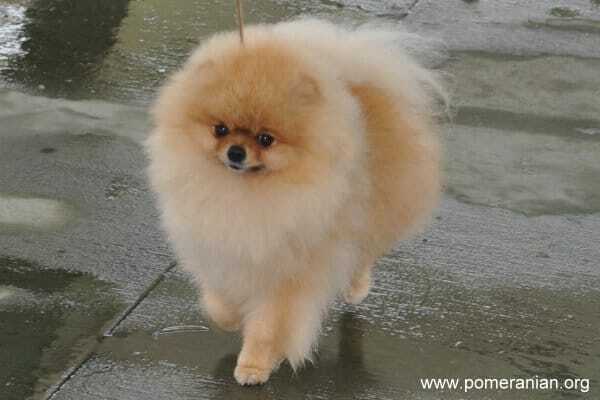 For complete Pomeranian Grooming information refer to the Pomeranian Grooming Guide.